Foolish people with all their thoughts have this one too they are always getting ready to live but never living. So, are you living your life? Decide what you are Either foolish or a wise man its up to you? Living is more than surviving that includes survive with some mission direct to achieve it. If you don't have any objectives there is no way to say you are living you are just surviving for just doing nothing. That is investment for nothing that only leads to losses. Make your life meaningful and successful. Have your destiny. Making a objective is not the part of your success.Many people get their human life on Earth but only few people are making the life successful and meaningful. Your success will start when you begin to pursue it. To reach your goal or to attain success, you didn't need to know all of the answers in details advance. You just need to have a clear idea of what your goal is. The success may not that easy otherwise everyone would picked it as if fruit from a garden tree. Don't procrastinate when faced with difficult problems. Break your problems into parts and handle one part at a time. Take it easy to every diffculties. Think that you are not only one who get problem with everypeople are bounded by the net of problems and difficulties. Those who carefully cut off the net liked difficulties and able to cross would be the one who succeed otherwise you may stuck in the way and never reached to destiny so, never loss hope even unlucky ones get the right key to unlock the door from the bunch of key at last if he/she don't lose the hope. Make yourselves ready to involve in work keeping your mind in alert for doing something that need to do in its appropriate time. Develop tendencies towards taking action. You can make something happen right now. Divide your big plan into small steps and take that first step right away. When the works are divided into pieces even a difficult would be completed easily as you everone get extra enegry and inspiration with the simultaneous completion of portions of your tasks one after another. Everyone who ever got where they had to begin where they were. Your big oppurtunity is where you are right now. So, do what ever you are willing to do from the place where you are. Take a leap towards your destination. Take your first step to reach your hope. Make your dream your destiny. Take a straight way to reach your goal even don't care any obstacles and distraction on the way to it. Be determinant to your goal and be brave to take your first step. 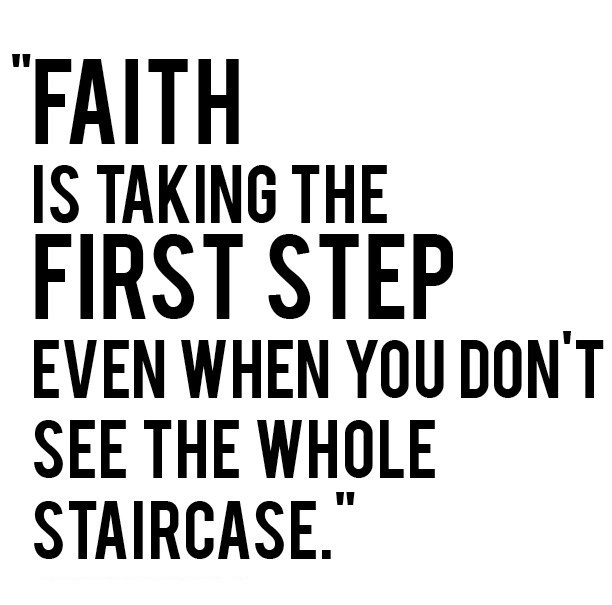 You should have faith on your initial step. You need to take steps yourselves to reach your own goal if anyone else take you there that's not your it's their victory. There is no one perfect than you who can perfectly act like you. Be Brave and take your THE FIRST STEP towards success. 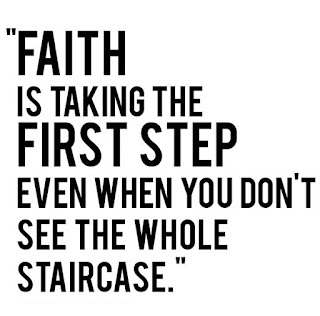 FAITH on your FIRST STEP!!! A journey of thousand miles begin with one step.